Home Uncategorized Neymar: How can PSG afford to pay £196m for the Barcelona forward? One hundred and ninety-six million pounds for one player. Just let that sink in. 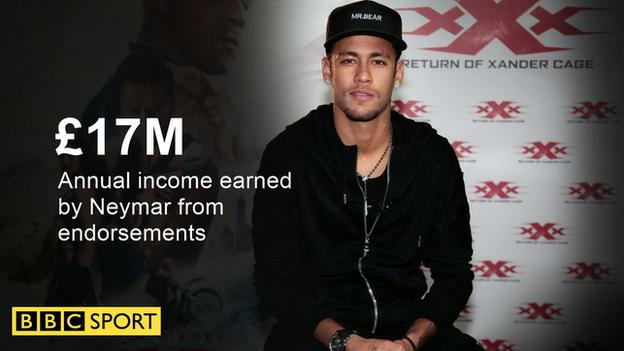 Paris St-Germain are reportedly ready to pay £196m for Barcelona forward Neymar. It is more than double the current world record fee of £89m paid by Manchester United for Paul Pogba and almost two and a half times that paid by Real Madrid for Cristiano Ronaldo in 2009. Both United and Real have an estimated worth of almost £3bn, according to Forbes, so it is not beyond the realms of comprehension that they could afford Neymar. But how are Paris St-Germain, not in the top 10 of the world’s richest clubs, able to spend almost a third of their value on one player? Could they structure the payments? Will it be £196m in one go? Instalments? A deposit-plus-interest-free payments for three years? “What you tend to find is when clubs buy a player – for large amounts or small – they will stagger these payments over a course of a contract,” Wilson says. “Let’s assume PSG pay £200m for Neymar and he signs a 10-year contract – they will pay £20m per year to Barcelona. Of course, the selling club has to agree to that length of time. “You expect there to be a decent upfront payment though. When Cristiano Ronaldo signed for Real Madrid from Manchester United for £80m in 2009, the English club demanded the fee was paid in full before it was allowed to happen. How do you recoup that money? PSG are set to pay huge bucks, and will be paying huge wages, for a player who is not only highly talented but also highly marketable. According to Forbes, the Brazilian is the 18th highest-paid sports star in the world with £11.54m earned from his salary and £17m from endorsements alone, thanks to deals with Nike, Gillette, Panasonic and Beats by Dre. That is great for him, but how can PSG get a slice – a large one at that? “I think they’ll generate funds from commercial endorsements and additional sponsorships because he’s obviously a very marketable player,” Wilson says. “PSG will be able to come to agreement with the player and his agent over image rights, and how best they can use him to promote the club. There are, of course, shirt sales. Fans of PSG and football fans in general will flock to the shops to buy the new Neymar shirts. But how much will the cash will the club get from the tills? Their shirts are sponsored by Nike and, according to reports, the club are paid about 24m euros (£21.5m) per season by the sportswear company. “There’s a myth around shirt sales,” adds Wilson. “The shirt manufacturer will take the lion’s share of the profits from the sales. “So, for example, the £75m Adidas pay Manchester United per year is a fixed fee. It doesn’t matter how many shirts they sell and the players that help sell those, they’ll only have that £75m per year. “You can never safely think the investment in one player will be paid back through a revenue-generating point of view. You remember Financial Fair Play, right, or FFP to give it its street name? It was all the rage when it was introduced by Uefa in 2014 with the aim of preventing teams from spending beyond their means. Clubs were asked to balance football-related expenditure – transfers and wages – with TV and ticket income, plus revenues raised by their commercial departments. Manchester City, Monaco, Inter Milan and Roma were among Europe’s top-flight clubs who were punished for breaking FFP rules following its introduction – they were handed fines and transfer restrictions. 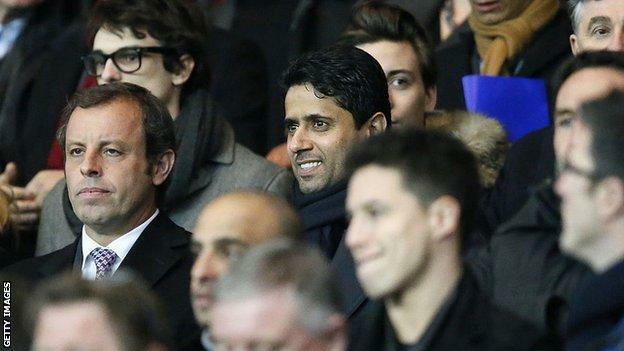 In 2014, PSG fell foul because their £167m commercial contract with the Qatar Tourism Authority was deemed to have an unfair value by Uefa’s independent investigation panel. They were given a £20m fine, their spending was capped to £49m and they competed in the 2014-15 Champions League with just 21 players instead of the usual 25. What is specific to PSG is that they are essentially owned by the Gulf state of Qatar via a fund, Oryx Qatar Sports Investments. Uefa FFP regulations – updated in June 2015 – state that clubs will be investigated if the owner – through a commercial sponsor he is related to – pumps more than 30% of the club’s revenue into a team. 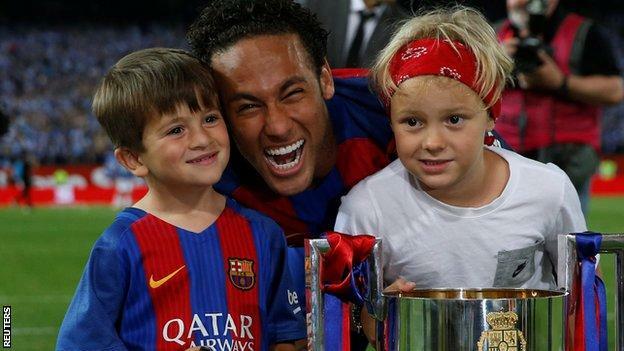 Barcelona club president Josep Maria Bartomeu says the six-time Ligue 1 champions will not be able to comply with FFP rules if they pay £196m for Neymar, having previously stated that he is intent on keeping his Brazilian player. “Whether they breach them or not will depend how the set of accounts will look like the next couple of years,” Wilson adds. “We don’t know really what amount of debt they will look at bringing in or how much the owners – Oryx Qatar Sports Investments – can realistically invest. “If they find a new commercial partner or sponsorship deal, that will offset the outlay for Neymar. You expect they have things in place to ensure that the impact of FFP is limited.